There are many memorable road trips by car. Due to some good reasons, we traveled to Warangal many times from Hyderabad by Car. This is about our first drive to Warangal. It was around 4 years ago. My husband and myself were excited about first long drive together. We were listening to FM throughout and enjoying the ride. Roads were not as good as they are now to Warangal, there was no 4 lane road at that time. There were many speed breakers on the way which used to pop up unexpectedly killing the speed :) So, overall it was bumpy ride throughout. It was the return journey to Hyderabad which was fun. 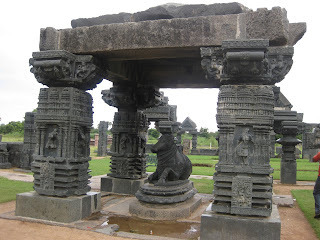 We went to Warangal for weekend and planned to return by Sunday night. But due to heavy rain, we stayed on sunday night and started very early next day at 5Am to Hyderabad. After some distance, there was complete fog and visibility has reduced to almost zero. We were going very slow. At some point, we thought we made a wrong decision by starting that early. We didn't expect that much fog. Thought of stopping for sometime, but slowly fog cleared making the road visible. So, slowly confidence increased and we were driving fast. When we were driving with good speed around 120 / 140 km/hr there was an unexpected sharp turn, my husband just saw at the right time and controlled the speed :) Thank God! Tyres screeched like hell and gave big sound, but he could handle it well. Driving fast on known routes was never a problem, but sudden speed breakers and sharp turns on unknown routes are dangerous to handle with speed. Later, we went many times to Warangal, never faced any problem again. Now, roads are very good, we have 4 lane road till half of the distance, which makes the ride a memorable experience.